These beautiful bendees from 1968 were the only figures ever made by the Colorforms people. 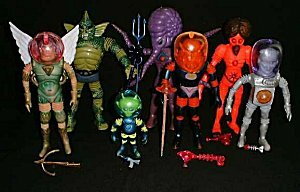 The Aliens, and Mattel's Sea Devils are generally the next level for folks who have completed their Major Matt Mason collections. Like Sea Devils, Colorform Aliens are very hard to find without wire breaks, damage or melts to the rubber, and with all of their accessories. If the first series wasn't enough of a challenge for collectors, there is a next to impossible second series of figures titled The World of the Future. There are rumored to only be a few of these prototypical sets in existence.